North Korea blasted the U.S. on Saturday for making what it called "gangster-like" demands in meetings between Secretary of State Mike Pompeo and Pyongyang officials, calling the attitude and stance of American officials "regrettable." The criticism came just hours after Pompeo left North Korea following meetings Friday night and Saturday morning. The meetings were intended to hammer out details toward achieving the goals in a joint statement by Kim Jong Un and President Donald Trump after their summit, in which the U.S. would provide security commitments for North Korea in exchange for "complete denuclearization of the Korean Peninsula." 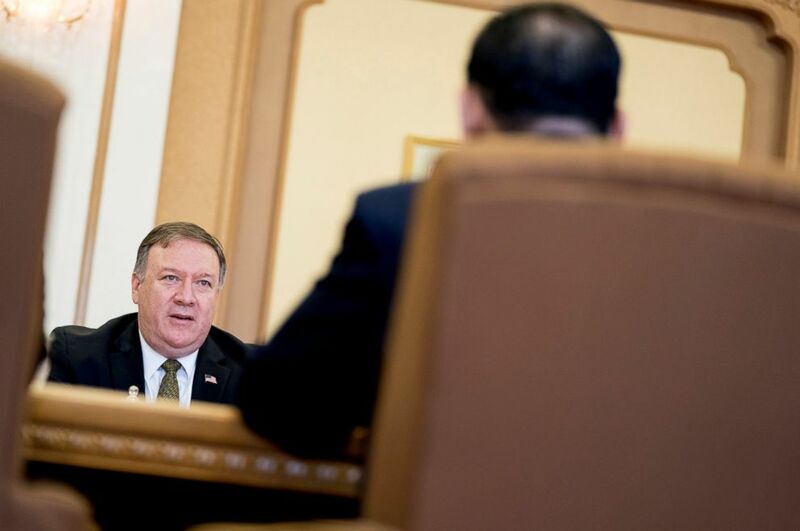 But Pyongyang said Saturday of its meetings with Pompeo, "We expected the U.S. side to come up with constructive measures to help build trust in the spirit of reunion. We were thinking about doing something corresponding to that." But, the statement continued, "The attitude and position of the U.S. during the talks ... was regrettable." North Korea had hoped to pursue a "balanced implementation" of the goals agreed to in the Kim-Trump joint statement, but the U.S. put forward a "unilateral and gangster-like demand for denuclearization" without referring to North Korea's goal of establishing a "peace guarantee" on the Korean Peninsula, the statement said. The terse statement, a U.S. source said, was expected. It is believed to be a negotiating tactic by the North Koreans. "We pushed them really hard to live up to the commitments of the president, and they may be reacting to save face," a source, who asked not to be named, told ABC News. Secretary of State Mike Pompeo, left, speaks to Kim Yong Chol, foreground, a North Korean senior ruling party official and former intelligence chief, for a second day of talks at the Park Hwa Guest House in Pyongyang, North Korea, July 7, 2018. Tensions between Pompeo and North Korean leaders were evident even before the harsh words. Pompeo and Kim Yong Chol, a top adviser to the country's leader and a former spy chief, exchanged pleasantries Saturday after having had a cordial and relaxed meeting Friday night, but the U.S. secretary of state didn't seem pleased with Kim's forwardness. Kim asked Pompeo if had slept well, to which Pompeo said he had. "We did have very serious discussion on very important matters yesterday," Kim said, through a translator. "So thinking about those discussions you might have not slept well last night." Pompeo actually corrected him to say that he did sleep well: "Director Kim, I slept just fine." Kim said he heard Pompeo was "quite pleased" with the two sides' first meeting, but dropped a warning that "there are things that I have to clarify." Pompeo responded in kind, "There are things that I have to clarify as well." When asked about the apparent tensions, State Department spokesperson Heather Nauert said, "There's a lot of hard work to be done. We never thought it was going to be easy." Nauert told reporters that the two sides spoke during a dinner following their nearly three-hour meeting Friday night and they were "cracking jokes" and "exchanging pleasantries." 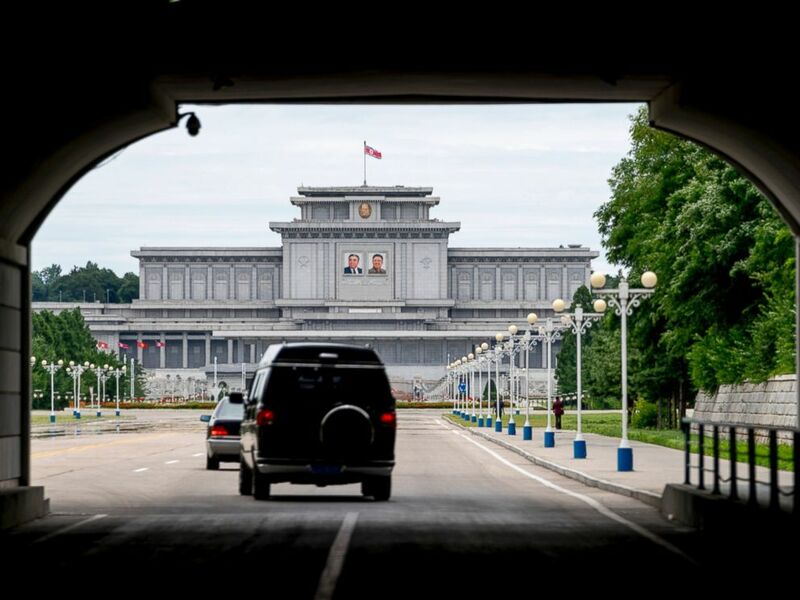 The motorcade carrying U.S. Secretary of State Mike Pompeo drives towards Kumsusan Palace of the Sun in Pyongyang, North Korea, Friday, July 6, 2018. Pompeo is on a trip traveling to North Korea, Japan, Vietnam, Abu Dhabi, and Brussels. She wouldn't characterize Friday's discussions beyond saying they addressed denuclearization and the repatriation of American remains, saying, "We expect them to live up to their commitments." She stressed that U.S. policy hasn't changed, but did not explain why they're not using the phrase "complete, verifiable and irreversible denuclearization" -- a phrase Pompeo himself used leading up to the historic summit between Kim Jong Un and Trump in Singapore on June 12. Pompeo departed for Tokyo on Saturday afternoon and did not speak to Kim Jong Un on this trip as he has in the past, according to Nauert. The spokesperson told reporters that was never an expectation. Before departing for Japan, Pompeo briefly addressed the meetings with North Korea, saying, "Some places [there was] a great deal of progress; other places there's still more work to be done." Another meeting is scheduled between the U.S. and North Korea on July 12 at the Demilitarized Zone, with the Department of Defense to take the lead on those talks. ABC News' Mark Osborne and Sarah Kolinovsky contributed to this report.